Who doesn't love Minions? Ever since the release of 2010's "Despicable Me" and 2013's "Despicable Me 2", the world has gone wild for these cute, feisty little yellow guys! This summer we can get ready for more fun with the Minions movie hitting a cinema near you this July! In celebration of the new movie, Minions have taken over Kinder Surprise! 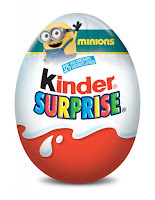 New collectable Minions can be found in specially marked Kinder Surprise eggs just in time for the movie! There are 11 different Minions to collect in all! On May 22, join Kinder for a special Facebook Page event for fans who have collected all of the Minions! You could win tickets to see the Minions movie when it comes to theaters in July! Have you made a Minion yet? Kinder's yellow surprise capsules look like the little yellow guys. You can easy create your own by collecting capsules, googly eyes, black markers, felt and glue! Let your imagination do the rest! Share your creations on Facebook and Instagram, don't forget to tag Kinder Canada! 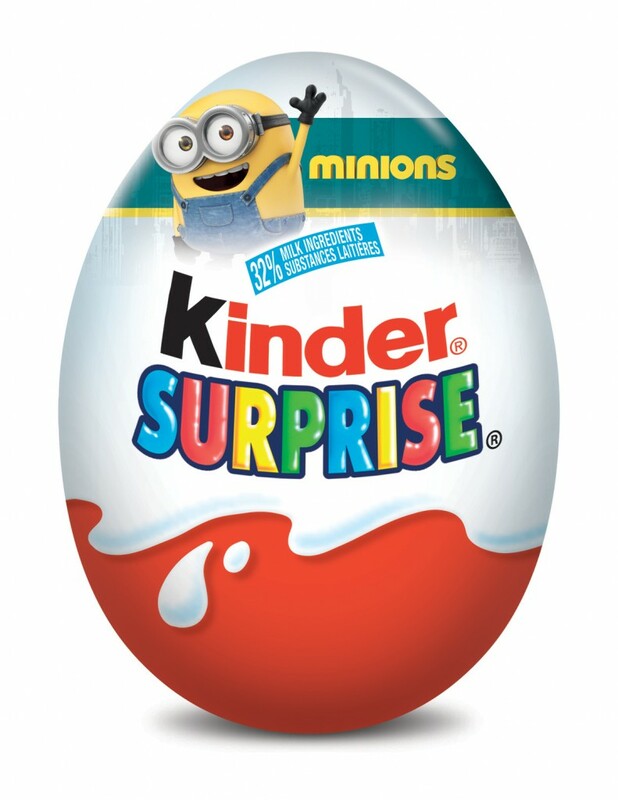 In the name of all things Minion, AME readers have the chance to enter to win a Minions Kinder Sur-prize worth $40! You'll be able to collect all of the Minions in no time! Open to Canadian residents 18+ (excluding Quebec). Mandatory entry must be done for extras to count. Winner will be drawn at random using GiveawayTools on May 19th, 2015. Valid email address and skill testing question to qualify. Winners have 48 hours to claim before prize is redrawn. More about giveaways can be found here. Prize provided by representatives of Kinder Canada. By entering the giveaway you are accepting that if you win your contact info will be shared for shipping purposes only. Please allow 4-6 weeks after giveaway closing for your prize. Sponsored post in participation with the #Kindermom program. Opinions and comments on this blog are those of the author. Yes we are! My little boy is very excited about it! We are. The minions of course. My kids are looking forward to it too. We will definitely be seeing the minions movie. So excited for all the cuteness! I'll be seeing the minions movie with my grandkids! I can't wait to see how happy it makes them! Yes i am. Looks super cute. Will be seeing them with the niece and nephew. Yes,I am. The minions are so funny. We are excited to see the movie, my kids love Despicable Me! Yes we are. I think they are so cute! I'm not planning to go to the theater to see it, but i will watch it. I hope those minions are as cute and charming as they've been in the past!! We are planning on watching it. They're really cute! My little guys love the Minions. The movie should be fun! We are planning on seeing the Minions. We are most looking forward to the Minions. I'd like to watch this movie with my son. My little cousins are planning on seeing it. I may join them. My son will be taking my grandchildren to see it. I am looking forward to seeing the Minion movie because I loved the Despicable Me movies! I also get to spend quality time with my niece and nephew! I can't wait to see it as it's a movie I will enjoy with my son! Yes, my boys love the minions - will be a great family movie! Yes I'm definitely planning to see the new minion's movie. I'm looking forward to their banana filled adventures. I hope to watch the Minions movie, they make me laugh and are so cute! will definitely see this movie. Yes I love the minions! Heck yes, we are! I'm looking forward to how funny it will no doubt be. oh, yes, going for sure! Love the Minions! They are just too cute! My boys are HUGE Minion fans and my hubby too! We have seen both Despicable Me movies 100 times! We can't wait for the new Minion movie! Yes, I have to take my daughter to see it. It looks funny. Most definitely yes!! I love the Minions they crack me up!! Yes we're planning on seeing it. I love the minions cute voices! I am definitely looking forward to watching it!! I love that the minions are so funny and always up to hijinx!